Digital cameras are amazing tools that can turn the gloomiest scenes into acceptable pictures. That was just as well during my June 2007 visit when the weather was generally uncooperative. On a typically grim morning 755 001 and 755 002 dragged a late running Pn44235 up the gradient through dull and drizzly Brezova u Broumova. This picture shows a Swiss designed, Roumanian built loco in the Czech Republic with a train to Poland. Polish Railways (PKP) uses these ST43 class diesels on cross border services between Mieroszow and Mezimesti. They can often be found sitting in Mezimesti yard waiting for clearance to return home. ST43 0140 was photographed there at midday on 28 June 2007. Both 750s working Hradec Kralove to Trutnov fast trains were fairly smoky. 750 312 had the cleaner exhaust but still put on a fine display leaving Cerveny Kostelec with train R951 on Saturday 30 June 2007. When Trutnov needs to send a pair of 742s to Jaromer to collect a freight, they're usually tacked onto the front of a scheduled passenger train. In this case it's possible that the railcar had failed as it's at the wrong end of the train to continue from Jaromer to Hradec Kralove. 742 093 and 742 080 were dragging 854 207 and trailer towards Cerveny Kostelec on train Sp1783 on 30 July 2007. They returned north with a freight later in the day. After more than 3 days of watching the sun disappear every time a train got close, I finally got a shot in decent light on Saturday afternoon. 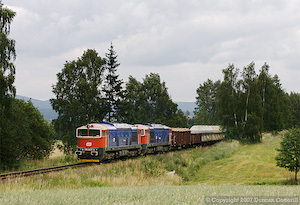 754 048 powered up the hill out of Velke Svatonovice with train R656 from Trutnov to Cheb at 16:56 on the afternoon of 30 June 2007. On Sunday morning I made one last desperate attempt to get the Brezova u Broumova shot. The weather wasn't looking good as I left Nachod but further north the sun came out and stayed out for the 09:40 freight from Mezimesti. The 755s were having a rest so 751 220 and 751 101 provided the power. This was what I'd come for and I could now go home feeling reasonably happy. 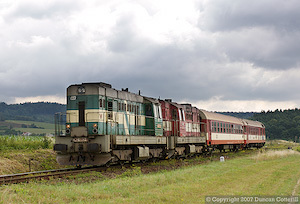 It had been a couple of years since I’d visited the Tyniste nad Orlici – Mezimesti line in the north of the Czech Republic but an increase in the number of freight trains prompted a return visit in June 2007. There was also the opportunity for a first visit to the nearby Jaromer – Trutnov line, which now has regular loco hauled fast passenger trains and turned out to have a lot of photographic potential. A full list of sightings on the Mezimesti and Trutnov lines can be found on the sightings page. I took CSA’s early flight from Heathrow to Praha, unusually arriving on time at 10:35, and then continued to Hlavni Nadrazi by bus and metro. In spite of a slow journey into town, there was plenty of time to buy the usual first class Sitove Jizdenka (Network Ticket) before catching R959, the 12:11 Trutnov train. 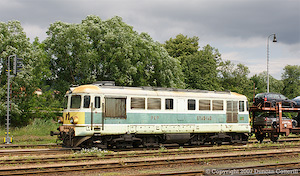 Old friend 150 013 was in charge to Hradec Kralove. Highlights of the journey were seeing 121 030 on a coal train at Velky Osek and an unidentified 742 at Chlumec nad Cidlinou on Sp1871 to Trutnov. At Hradec Kralove blue and grey 754 051 took over for the remainder of the journey to Trutnov. I got off at Starkoc and transferred to Sp1742 for the short trip to Nachod. Disappointingly this was worked by 810 565, hardly what you’d expect on a semi-fast but unfortunately the norm for these services. The excellent 4* Hotel U Beranka at Nachod was my base for the trip. This long rural line runs north from Tyniste nad Orlici, on the electrified west – east secondary main line between Hradec Kralove and Chocen, to Mezimesti on the Polish border. The southernmost 30km of the line are fairly nondescript but just south of Nachod the route enters the picturesque Metuje Valley. For the next 36km the line follows the river much of the way but also climbs over a couple of significant summits. Nachod is the largest town on the line with several fine old buildings surrounding the main square and an even finer beer, Primator, emanating from its brewery. The next section, through Hronov to Police nad Metuji, is relatively heavily populated (relatively being the operative word). From Police north to Mezimesti is much more rural and the line runs through a mixture of wooded, hilly country, rolling farmland and small villages. Despite the pleasant scenery, it’s not an easy line to photograph. Most of the potential locations are heavily overgrown to the extent that they’re not worth thinking about. There are a couple of fine spots either side of Brezova u Broumova and more positions just south of Zdar nad Metuji. The line has became even more of a backwater this year. In December 2006 the two through services to Praha finished and there was a significant reduction in the number of loco hauled local services. A further blow came on 10 June when new class 814/914 railbuses were introduced on the line, prompting a further decrease in the level of locomotive haulage. The current service requires two 814/914 sets, two class 714 hauled sets and several class 810 railbuses. On 3 of the 5 days I was on the line, one of the 814 turns was being covered by a 714. Actual observations are listed on the sightings page. The full timetable is available on the CD website. Note that five 714s were seen (714 201/6/7/12/3), rather a lot for two regular duties and an 814 substitution. I wouldn’t be surprised if there aren’t now a couple of 714 turns on the Tyniste n/O to Letohrad route as well. The border crossing from Mezimesti to Mieroszow in Poland has always had some freight traffic but most trains used the nearby Letohrad – Lichkov – Miedzylesie line until the beginning of May this year. When electrification work began on the Lichkov route, the international freights were diverted to the Mezimesti line. To cope with the additional traffic, several pairs of class 751 diesels were drafted in and they were joined recently by the class 755 prototypes. Unfortunately, many of the freights run at awkward times due to pathing constraints, particularly on the busy Vaclavice – Nachod – Hronov section. One of the most promising trains never ran during my visit. That only left one well-timed train each day, Pn44235 at 09:40 from Mezimesti. 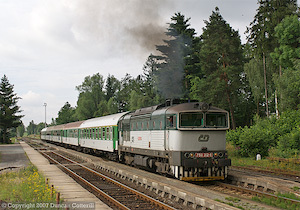 There is no direct connection from the yard at Mezimesti to the Tyniste line and departing freights have to back out of the yard towards Mieroszow before running forward again through the station and away towards the south. In the other direction, PKP class ST43 diesels (Romanian class 060D) work freights across the border and tend to sit on their trains, opposite the station, for a long time before returning home. There is a convenient footbridge over the west end of the station from which ST43 arrivals and departures can be photographed. There were 3 pairs of 751s in regular use (751 038 + 751 236, 751 176 + 751 354 and 751 101 + 751 220) with another two locos (751 093, 751 094) spare at Mezimesti. 755 001 and 755 002 are on loan from Praha for a limited period and are expected to return home shortly. During my visit they usually worked the 09:40 train south from Mezimesti, returning north to Nachod in the middle of the day and then continuing to Mezimesti in the evening. Freight train times can be found on the Bahnfuhrer website. I had no intention of spending much time on this line but by Friday lunchtime I was getting fed up with the lack of action on the Mezimesti route and decided to try something different. I’m glad that I did. Like the Tyniste – Mezimesti line, this route starts on the plains but soon encounters attractive, hilly country. The scenery improves dramatically near Starkoc, only 3km from Vaclavice on the Tyniste – Mezimesti line. A steeply graded connecting line links the two routes (Table 033). North of Starkoc, the scenery is every bit as good as that on the Mezimesti line and there are many more open spots where photography is possible. It appears that much of the lineside has been cleared recently, particularly around the level crossings. The best spots appeared to be either side of Cerveny Kostelec and between Suchovrsice and Male Svatonovice. Cerveny Kostelec even has semaphore signals. The Trutnov line enjoys a much better passenger service than the Mezimesti route. Trutnov – Jaromer locals alternate with Trutnov – Hradec Kralove fast trains to provide an hourly service between the main stations. Most of the locals are worked by stylish class 854 railcars, some paired with new class 954 driving trailers. A few trains were 810 worked. Class 742 locos occasionally turn up piloting the railcars when they need to get to the other end of the line to work a freight. The fast trains are booked for class 754 diesels but Letohrad only has three of the class to cover a five day diagram so other classes inevitably appear. Most of the fast trains go beyond Hradec Kralove to Praha with some continuing further west. A few trains are classed as semi-fasts (Sp) east of Hradec Kralove and only become proper fast (R) trains west of HK. The diesels only work as far as Hradec Kralove with class 150 or 163 electrics taking over for the run to Praha. All three 754s were in use (754 030, 754 048 and 754 051) together with 750 258, 750 312 and a sparkling 749 008. Apart from 754 030, which was in plain green/grey livery and looking very unkempt, all the locos had something going for them. 754 048 has large yellow panels on the ends that lift the normally drab grey/green livery and 754 051 carries a reasonably attractive blue/grey scheme. The 750s are quite plain but 312 has a fairly ineffective silencer and is as noisy as a Goggle gets and 258 smokes like a steam engine. 749 008, a long time favourite, looks superb in orange and grey and is nice and clean at the moment. Actual workings are listed on the sightings page. The full timetable is available on the CD website. There isn’t a great deal of freight traffic on the Trutnov line and it’s all worked by class 742s, usually coupled cab to cab in pairs, a most unattractive combination. The only freights I saw were a northbound at 14:22 on Saturday and a southbound at 17:34 on the same day, both near Velke Svatonovice. The first didn’t correspond to anything in the Bahnfuhrer timetable but the second was probably Pn63321. Locos were 742 080 and 742 093. The journey started straightforwardly enough. I travelled from Nachod to Starkoc on an 810 then went for a trundle up to Trutnov on another railbus to catch a fast train all the way back to Praha. I could have caught R654 directly from Starkoc to Praha and tried a couple of hours of photography there but decided that it wasn’t worth the bother, a decision I would later regret. 754 030 worked Sp1785 to Hradec Kralove where 163 067 added a couple of coaches to the front and the train miraculously became R962. As on the outward journey, no class 130s were seen on local passengers around Hradec Kralove. Everything was worked by 163s, many of them numbered in the 2xx series. 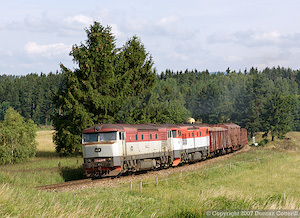 At Chlumec nad Cidlinou, Sp1780 from Trutnov (via Stara Paka) was seen with 742 080, the same loco that had been working freight on the Trutnov – Jaromer line the previous day. Near Nymburk a gleaming 141 (No 001 judging by the livery) passed on R791 from Praha to Letohrad. If I’d caught the earlier train, I could have photographed it at Praha, assuming it had been in the right platform and the sun had been shining. Perhaps not then? The fun started at Praha Airport. After calling everyone to the gate a good hour before departure, CSA then decided that the plane was broken and we had to wait while they saved up to buy a new one. Eventually another 737 turned up and we finally got away over 100 minutes late. Full marks to the crew who went like the clappers all the way and made up about 30 minutes by the time we arrived at Heathrow. Then we just sat and waited for almost 2 hours. Terminal 2 had been evacuated. Nothing to do with terrorists but a good old-fashioned gas leak. When we finally got off the plane there was a huge queue to get through immigration and in spite of the presence of large numbers of armed police there was almost a riot when non-EU passport holders were called to the front of the queue while the vast majority of us had to wait. The situation was quickly diffused by letting everyone go through the under-utilised non-EU desks as well as the overworked EU ones. I finally got home after 02:00 on Monday morning, over three hours late. The imperfect end to an imperfect trip. This was the least rewarding trip I’ve had for a long time. The Mezimesti line was particularly disappointing. There were far less loco hauled passengers than on my last trip in April 2005 and less freights as well despite the diversion of trains from the Lichkov route. The weather was also generally uncooperative. It wasn’t that dull overall but the trains always coincided with the cloudy periods and the sunny spells always occurred during the gaps in traffic. If it had been properly cloudy I would have gone travelling but there was always a chance of getting a sunny shot so I had to wait by the lineside just in case. It was late Saturday afternoon before I finally got a shot in good light. Sunday morning produced another good shot but that was it. Two shots in good light, a handful in "cloudy/bright" conditions and another in very high midday sun is a very poor score for a 5 day trip at any time of year. After a phenomenally successful trip in April, it was probably just redressing the balance though. It may sound blasphemous to some but I was pleasantly surprised by the interior of the 814 units. PARS have done an excellent job in producing comfortable, modern trains from the utilitarian 810s. They also seem smoother riding although still quite noisy inside. Compared to the awful Russian class 835, now happily departed, the 814 is a Rolls Royce job. Apart from the fact that they’re not very photogenic, the lack of seats is likely to be a problem and is the price of producing a spacious, comfortable interior. A 2-car 814/914 unit has around 72 seats compared to 110 for an 810 and trailer or 180 for a 714 with 3 trailers. How they will cope with the heavy weekend loadings is still to be seen. 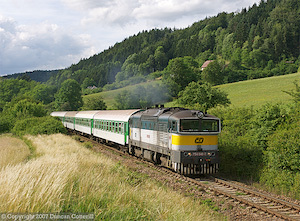 The Trutnov line was a pleasant change after the frustrations of the Mezimesti route. Although the weather was no more cooperative, at least there were frequent trains that would have been worth photographing if the sun had come out at the right time. The locations aren’t the most exciting in the Czech Republic but they are respectable enough and there are plenty of trains to photograph. Most of the shots would work in autumn, winter or spring and midsummer probably wasn’t the best time to visit. However it was a useful reconnaissance exercise. I’ll certainly be going back to this line in the not too distant future. The Mezimesti line is hardly worth a visit in its own right anymore but given its proximity to the Trutnov line, it’s worth a look at if you’re in the area. Spring or autumn would be better times for a visit when the sun shouldn’t be too high for the 11:00 freight departure from Mezimesti. Elsewhere, the Chlumec nad Cidlinou to Trutnov semi-fasts seem a good bet for class 742 substitution at the moment. More interestingly, Friday and Sunday trains between Praha and Hradec Kralove seem prone to class 141 substitution.